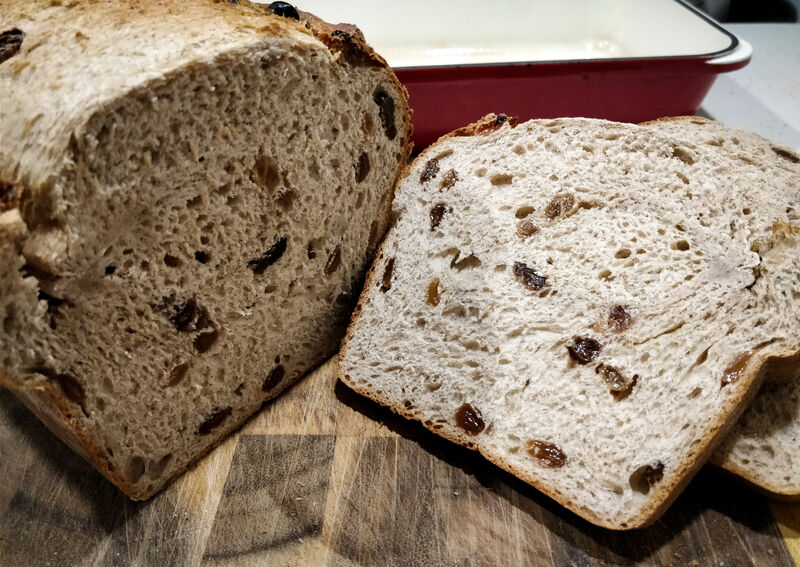 Been solidly into baking breads for the past 6 months most weekends and would like to share some of the recipes i've come up with to get feedback and thoughts. I still need to improve my shaping technique but especially considering my White Spelt breads rise so much in the oven. 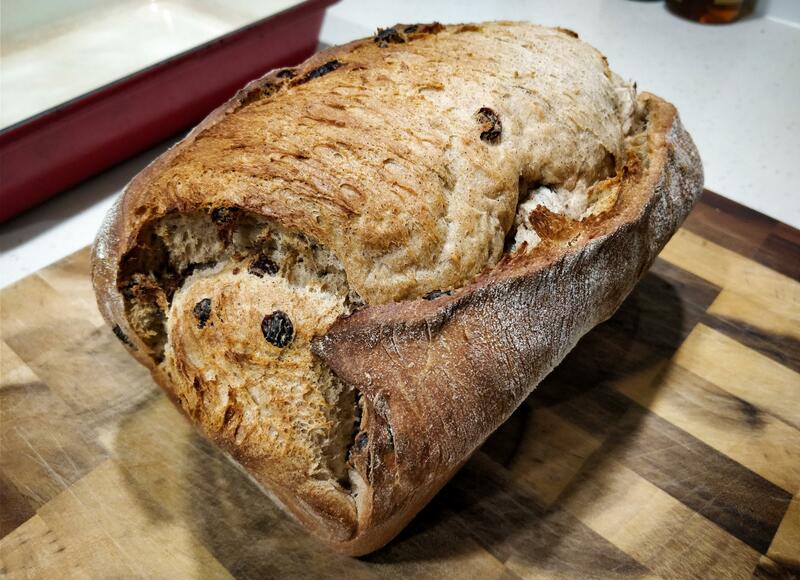 This recipe is a White Spelt Raisin Bread. 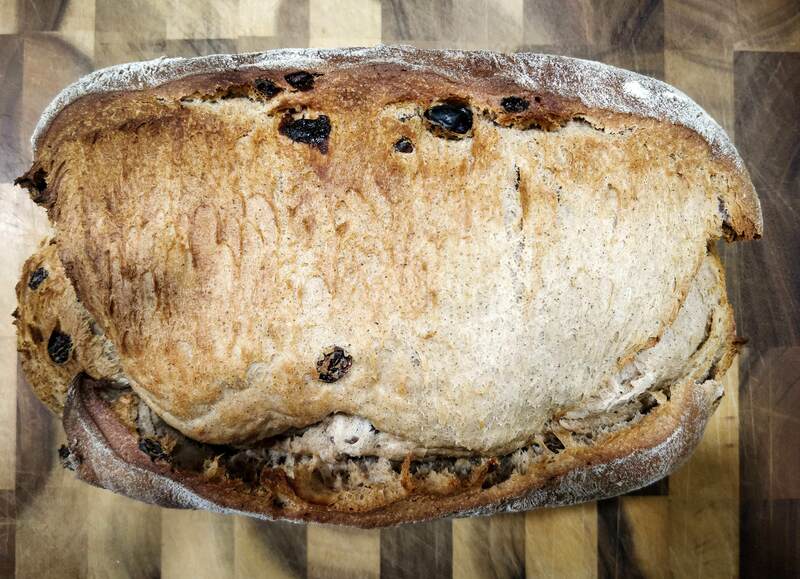 It's essentially a Hot Cross Bun bread mixture with roughly half white spelt, but in a loaf. One of the greatest things about my Spelt bread recipes are how short the proof is for Spelt so you can make the loaf much quicker. Microwave for 20 seconds, remove and whisk thoroughly. Continue to microwave for 20 second intervals, removing and whisking in between until its thickened up considerably. Cover with cling wrap and place the now prepared tangzhong in the fridge to cool down. In a mixer (I use a kenwood chef), put the remaining bread flour, the sugar, the guar gum, the mixed spice, the raisins, the yeast and the salt and mix to combine. Put all the milk in a small saucepan and heat until it just starts to boil. Immediately set aside to cool (I usually put the pan in the sink which is filled with cold water so it cools quicker). Melt the butter in the microwave in a cup/bowl. Once the milk and tangzhong are cooled to luke warm or less, add the milk, egg, tangzhong and the melted butter to the mixer. Grease a large bowl (with olive oil) and place the dough ball in there. Lightly coat the dough ball with the oil too. Cover and set aside for 30-40 minutes, until it's roughly doubled in size. Grease a bread tin with olive oil (i use a 28cm x 10cm tin non stick). Put the log in the bread tin and cover with cling film. Preheat the oven to 200c fan forced. Let the bread rest for 15-20 minutes checking its proofing with a poke test. Once proofed, remove the cling film and score the bread down the middle length ways. Pour a little water (30-50ml) into the bottom of the oven to create a little steam and place the in the oven on the middle shelf. (I take out the top shelf as the bread rise can be restricted by the shelf above). Cook for 30 minutes. I always check my loafs by knocking underneath but find my spelt recipes are always 30 minutes. Remove from the bread pan immediately onto a wire cooling rack. Allow to cook completely to room temperature before slicing. Lovely and rich. Well done! Very nice loaf indeed. I've sent your recipe to a friend of mine. Hope you don't mind. Thanks. No problems at all! No problems at all! Hopefully I've written it out so that others get similar results.